Wow. I wondered what direction they'd take the cover for the fourth Lady Julia Grey novel in and I have to say I am thoroughly pleased with the result. It's not at all what I was expecting, but I think it sort of melds the two different cover themes they had going nicely. I was a huge fan of the two original mysteriously Victorian covers with their hint of splendor and their Gothic buildings and faces hidden under hoods. The newer reissues took me a bit by surprise with their more modern, enticing air. And that's why I think this is a lovely compromise. We've been so fortunate this year with two Deanna Raybourn books coming out and I am already counting down the days until the release of Dark Road to Darjeeling--due out October 1st! I'm really excited for the new Lady Julia Grey book..it's been so long since I finished the others it feels like..
Love this cover. And the title. I have yet to read this series, but it is on my list!!! I promise! Bookaholic, if you haven't read SILENT IN THE GRAVE yet I highly recommend it. Then you'll know for sure if this is a series you want to dive into. Heather, it really does feel like a long time, doesn't it? I need to go back and re-read SILENT ON THE MOOR for the first time so I'm ready! bish, oh, I'm so pleased to hear that! It's a great series, isn't it? I'm incredibly fond of Lady Julia and Brisbane. And that Amazon thing is pretty widespread apparently. I saw several other books with the same issue yesterday. Some of it's pretty hysterical, as you said. hehe. Just found your book blog through another one and I'm liking it. I loved the first 3 Julia Grey novels too and can't wait for this one. The original covers are what drew me to the series in the first place. Oh, that's pretty. I'm also a fan of the original covers for the first two books and have considered ordering the UK editions. (Have you ordered them?) This cover for the fourth book is a nice compromise. And I really can't wait! I've been holding on to my copy of The Dead Travel Fast to read after the Julia Grey. I know I'll want to read a new Deanna Raybourn soon after Darjeeling, so it will be nice to have one on the TBR pile waiting. Misti, welcome! We're so glad you're here. :) And I agree. The original covers were just perfect. I'm so sad they're gone now. Though, as Karen mentions below, the UK covers are delightful as well and a nice substitute for the original US ones. They have a bit more playful flair, I think. Elizabeth, thanks for the reminder on the Russell/Holmes one! I'm so ready for a new adventure with them. Karen, *sigh* I haven't yet. The funds...they are always low. But I'm afraid they'll disappear from The Book Depository before I get around to it. I need to. oooooo.... that cover is GORgeous! AND Silent in the Sanctuary and Silent in the Grave have totally different covers on Amazon then the ones you've linked here. I find all the cover switching a bit dizzying. Did the books switch publishers, maybe? All I know is it makes it pretty hard for me to keep track of the series. KMont, it's a bit crazy. They started off with the covers I linked to for the first two books. Then they decided they wanted to attract some romance readers that might not pick up the other covers because they looked too "literary" so they did the SILENT ON THE MOOR cover featuring a bit of Brisbane. Which is nice but the whole pose thing doesn't work for those of us who have loved and read these books. Just doesn't look quite right, you know? Then they re-issued the first two with similar covers to create a series look after the fact. 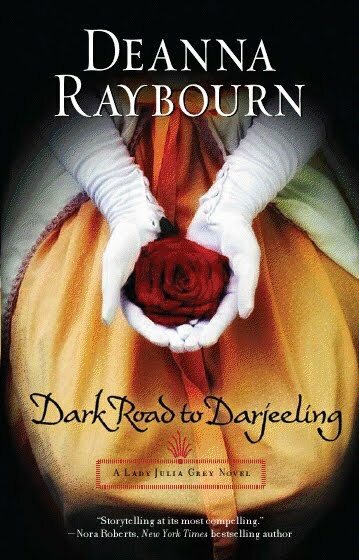 I think there was enough of a backlash from loyal readers that they produced this one for DARK ROAD TO DARJEELING as a compromise between the two. The covers you linked to are the UK versions and they really are lovely, aren't they? I've been wanting to order them for awhile now but never had the ready funds. But they're not available here in the US. They are through The Book Depository, though. Lani, it's SUCH a great movie. That scene kills me every time. And, yes, I have watched it, ahem, several times.